Rinse any ice glaze from frozen Alaska Salmon under cold water; pat dry with paper towel. Heat a heavy nonstick skillet over medium-high heat. Brush both sides of salmon with oil. Place salmon in heated skillet and cook, uncovered, about 3 to 4 minutes, until browned. Shake pan occasionally to keep fish from sticking. Turn salmon over and sprinkle with seafood seasoning. Cover pan tightly and reduce heat to medium. Cook for 2 minutes; add the wine and butter to pan. 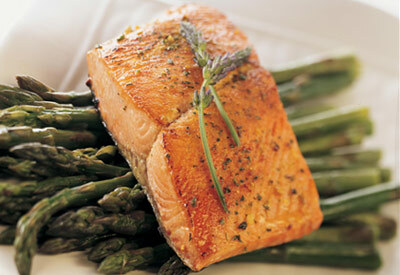 Continue to cook, uncovered, an additional 4 to 6 minutes for frozen salmon OR 1 to 2 minutes for fresh/thawed fish. Cook just until fish is opaque throughout and sauce is reduced. Drizzle sauce over salmon when serving.